alright sounds good, thanks for the update! call me when its ready! Beaver at bass central said that she ships this week, i paid the rest off, if you need to check address or something, let me know. 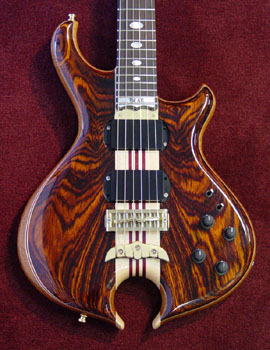 Pat; if you don't mind, please post pictures of the finished guitar in the showcase section. I really want to see how this guitar turned out! I definately will, im so excited, hopefully it shipped, Mica or Val if you know anything, call me please! Im so psyched, this baby is gunna be the golden child! It's likely to ship on Monday at this point. Val or I will call you with the tracking number so you can watch its every move on the way to you. Thanks for the pic, Mica! 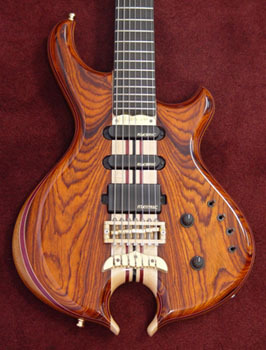 I just really like looking at this guitar! WOW THANK YOU SO MUCH MICA! Another (beautiful) Alembic finding a home in CT! How is it? Pix? Inquiring minds wanna know! LOL! I dont know how it is just yet, but im excited! Ill let you guys know, ill post plenty of pictures from any angle, and ill try to make some videos/soundclips of the guitar in action! Congrats on the guitar and the COTM. It really came out spectacular. I love the pattern in that coco bolo top. It's like they were separated at birth! Congrats!! Great pics of a beautiful guitar! Congrats on COTM honors, Pat! Very well deserving, if I may say so. I love the coco top and (as you may notice if you peek over at my FTC thread) I especially like the pickup configuration. 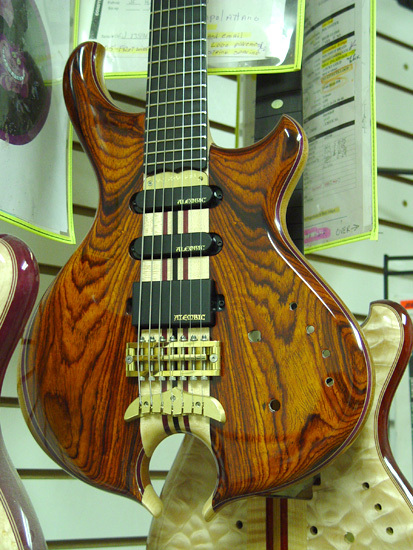 I've never had the hankering to try 7 strings, but this one would be enticing. Play her in good health and ENJOY! Congrats Pat. Very, very nice. Jonathon, your top could almost be a negative image of pats'. Both very nice guitars. Congratulations Pat. Beautiful guitar and well deserving the "Featured Custom." Mica - I love the background you put together for this month too - a nice companion to the image of Pat's incredible guitar. Thanks so much guys, ive been so busy lately working in the studio and playing out all the time now. Ive gotta say the guitar rocks. Took some getting used to but my lord nothing fits like this neck! Its my favorite part! Ill post some more pictures soon but its been a very bad week in the family. My dog passed and my best friends father died on the fourth of july so its been kind of hectic. Thanks for the enthusiasm! see you cats later!